Tired of cheap business cards or cards with someone else’s marketing on the back? Stand out from the competition with quality business card printing from PrintHouse(45). Print business cards with us... it's fast, easy and affordable! 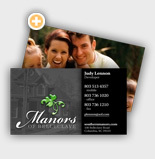 Our full-color business cards will help make the first and lasting impression you want for your business.